What a difference a decade makes. Ten years ago Thursday was bursting onto the scene blazing a new path that would set into motion the emo/scream movement of the millennium, and today, with their latest, No Devolucion, the band is doing their best Thrice-esque about face, trading in angling guitar riffs and high arching hooks for something entirely ambitious - No Devolucion, which sounds something akin to a rebirthing for Thursday, as they rise from the ashes of a sound that now seems all but dead to them, one that has been copped and boosted time and time again by one copycat act after another. This record is smart, mature and adventurous; an epic showcase of what this band is truly capable of accomplishing. No Devolucion is sharp, heady atmospherics amidst a sea of muddled noises and effects that does not lack a discernable crunch, a sort of breathtaking noise that would make even the Deftones smile, one done to the absolute grandiose hilt. The label art-rock could possibly be floated in the ethers to describe No Devolucion, though the difference between this release and many of its pretentious ilk is that this sound is real and far from convoluted. Things get a little too garage-y for their own good on “Open Quotes” before Thursday effortlessly tears things down only to rebuild them in bombastic fashion with the fire-spitting “Past and Future Ruins.” “Empty Glass” gives the record emotional breadth via a memorable vulnerable affair not unlike “This Song Brought to You by a Falling Bomb” (swap out the piano for an organ). The penultimate “Turnpike Divide” is perhaps No Devolucion’s best cut, but it isn’t without stiff competition (“Fast to the End,” “No Answers”). And regardless of whatever tune the listener decides as best, they can rest assured they will not be disappointed. No Devolucion is uncharted waters for Thursday; though it’s not exactly the bands first attempt at stepping outside their comfort zone, a venture that did not go so well (just ask anyone who listened to A City by the Light Divided). 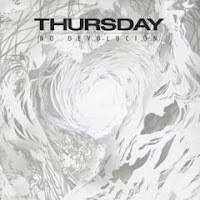 There are not many other bands (few, if any) that could pull this transformation off as well as Thursday has with what is perhaps their landmark release, No Devolucion.